As ephemeral as fragrance, this image of The Three Perfumes comes into focus like an ethereal vision. Dressed in flowing, heavily patterned jewel-tone mantels exquisitely adorned with roses and lotus-like blossoms, three maidens cluster around a fragrant white lily as blue and pink droplets of perfume rain down from them. 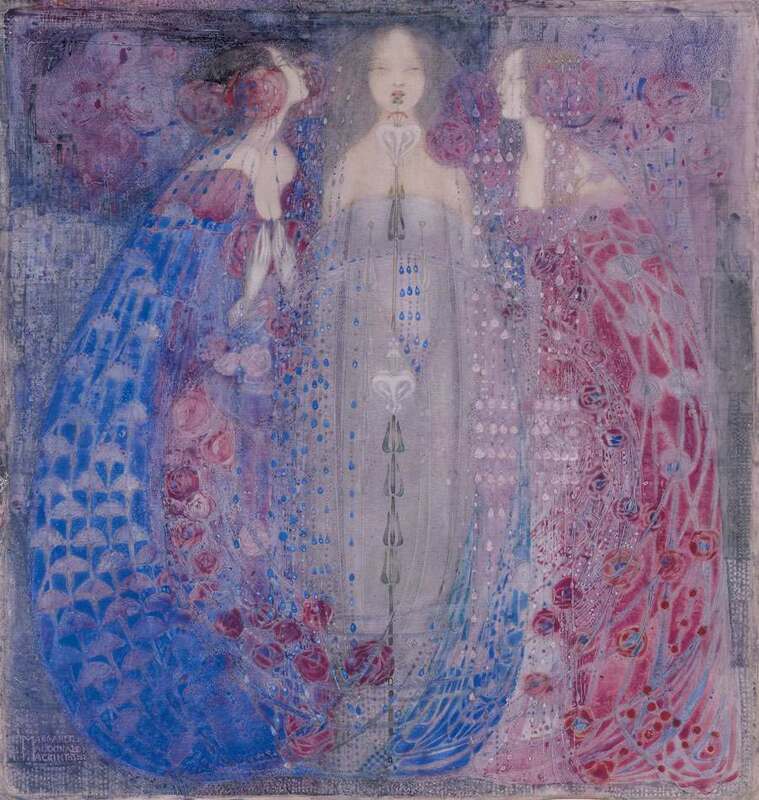 This rhapsody of fleeting beauty was produced by Margaret Macdonald Mackintosh, the wife and creative partner of Charles Rennie Mackintosh, the great Scottish architect and designer. Working together, they were pioneers of the “Glasgow Style,” a unique blending of ancient Celtic design and symbolism with Art Nouveau, an elegant stylization of foliate forms derived from nature. Mackintosh was accomplished in the fields of repoussé metalwork, oil and watercolor painting, stencils, fabrics, and interior design. This delicate watercolor of The Three Perfumes was purchased by Cranbrook Founder George Booth from the Detroit Society of Arts and Crafts’ “Exhibition of British Arts & Crafts” in 1920.